The most impressive thing about Space Channel 5 is how it combines every single cliche in gaming yet the final result is intensely memorable. Grab your checklist: There is an impossibly well proportioned, gun toting heroine. The plot involves a savage alien attack on unsuspecting mankind. The gameplay is typical rhythm-button input. This would be a formula for a yawn-fest but Sega added one last ingredient to the mix, something rare and precious in the world of big name game development: Style. One of the things I loved about Dreamcast era Sega was how unafraid the company was to bring new IPs to the market. In the final analysis, this might not have been the smartest thing for them to do. A safer approach like Nintendo’s mascot milking might have been an easier sell along with the new hardware. But Sega’s approach to the Dreamcast seems to have been to come up with a concept for a game first and then to hammer out the details around that core idea. This is how Ulala was born. She exists because Sega wanted to make this game and the developers realized that none of their existing mascots could make this game work. 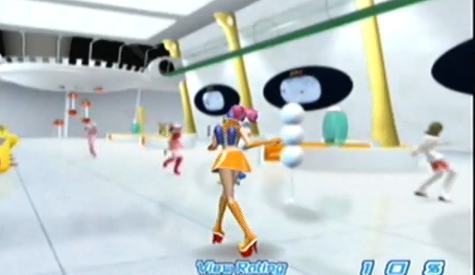 Space Channel 5’s gameplay should be familiar to anyone who has Guitar Heroed or Tap Dance Revolutioned. You will control Ulala as she walks through various sci-fi locales, battling an invading alien race known as the Morolians. As her method of battling them is to mimic their dance moves until she finds an opening to shoot them with her ray gun, you can guess what your job as the player will be. Space Channel 5 is a little more difficult than most of the rhythm games that followed it because there are no on screen indicators of what to do. You do not have any convenient falling symbols to guide you and help you keep beat. Fortunately being good at Space Channel 5 is scarcely a requirement for enjoyment. I, your humble reviewer, am terrible at this game. I cannot help but come back to it time and time again if only for the soundtrack. 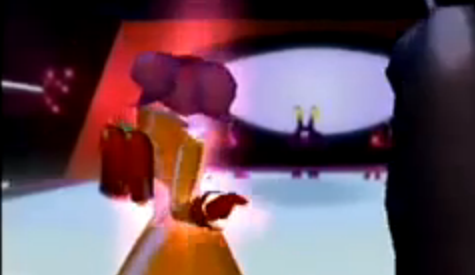 My theory that Space Channel 5 was designed around Ulala can also be be applied to the music in this game. It is a fast-paced, high-energy jumble of genres that is a joy just to listen to. If you have never heard any of the tunes from Space Channel 5, take a trip over to YouTube and do a quick search. No, really, go ahead. We’ll wait. The challenging gameplay and amazing soundtrack accompany visuals that have aged nicely. 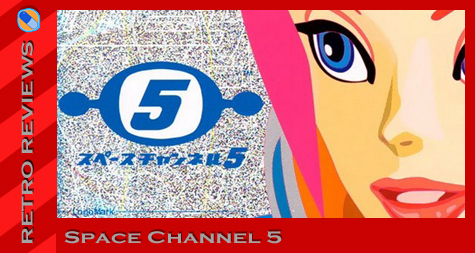 Space Channel 5 is a bit of a throwback to a simpler times. The backgrounds are all FMVs, the same stuff that programmers used to use to mimic the things the Dreamcast was designed to do. What they are doing in such a gorgeous Dreamcast game is beyond me but it has the effect of giving the game this glossy finish that meshes perfectly with the style of the game. Gogo boot-clad Ulala fits in perfectly upon the sterile environments and seamless corridors that she is rendered against. Where polygons were used, things have not aged quite as well. The game will still catch your eye but don’t look too closely or you will see blockiness in places that you’d rather not see blocks. This is especially bad with the back ground characters / dancers who follow Ulala as she blasts more aliens and frees them. It is obvious that most of the work went into designing Ulala and her named enemies / rival reporters. 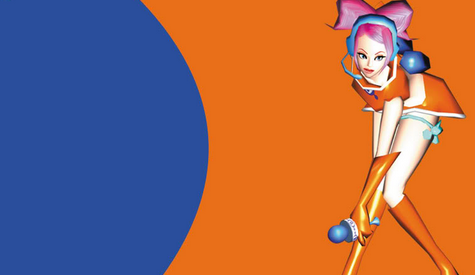 If Space Channel 5 sounds like the kind of game you need to get into (and it should since you apparently read a blog dedicated to Sega games), you’re in luck: It’s among the most common and affordable Dreamcast games out there. Even new copies can be had for less than $30. It was also re-released on the Playstation 2 with Space Channel 5 Episode 2 on the same disc. For the real collectors out there, there is a rare-ish GBA port. It is best that 99% of those reading this just forget that it even exists. It was released in tiny quantities and is among the sorriest excuses of a Sega game ever created. 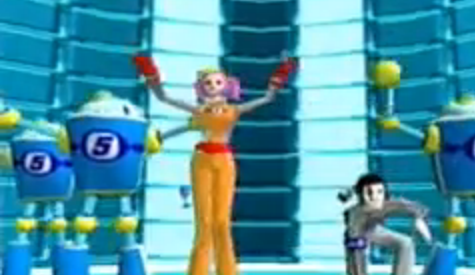 Space Channel 5 is, to me, the NiGHTS of the Dreamcast library–it is weird, it necessitated a whole new mascot to make the game work, and as the game ages the artwork becomes more and more iconic. 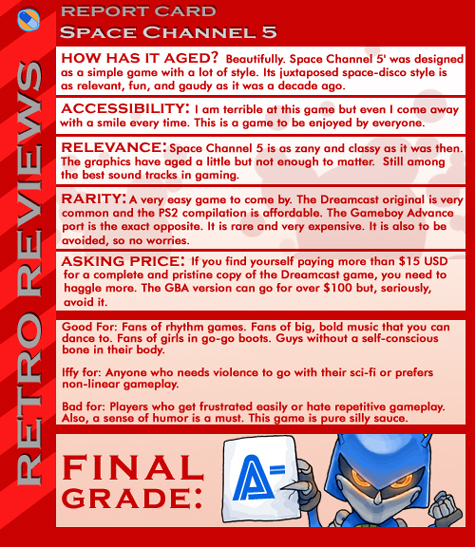 Space Channel 5 is not the most amazing rhythm game out there and it lacks almost all of the conventions that have improved the genre over the last decade. The humor, style, and soundtrack work in concert to keep this game relevant and fun. No Dreamcast library should be without this game. Want a peek at Nintendo Power’s Shinobi 3DS story?